PORTLAND, Ore. (CNS) — Responding to rhetoric from the recent presidential election, Archbishop Alexander K. Sample of Portland told a crowd of Hispanic Catholics Dec. 10 that he loves them and God loves them. 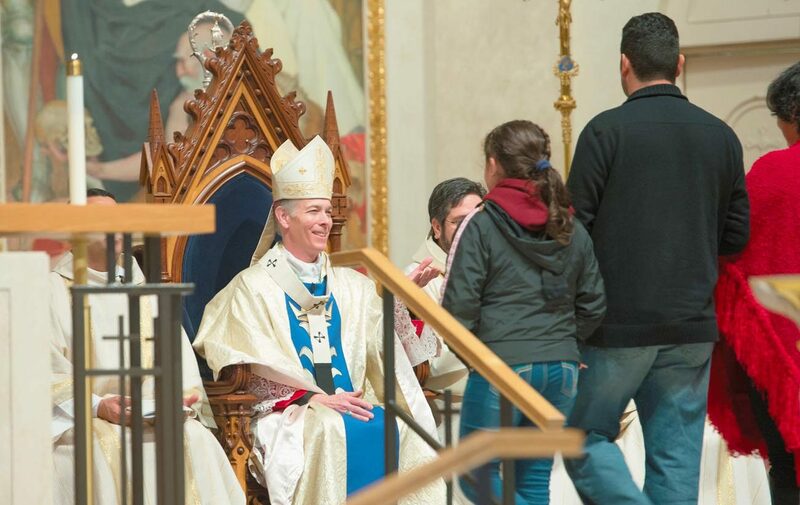 During the Mass for the feast of Our Lady of Guadalupe, the archbishop then called on all Catholics in western Oregon to condemn racial bigotry and hatred. The archbishop told the crowd that other western Oregon Catholics also love the Hispanic community, which has felt anxious over anti-immigrant sentiment that became explicit during the campaign. The archbishop told worshippers that Catholic Charities of Oregon is advocating for humane and just treatment of immigrants and said the nation’s Catholic bishops are committed to being a voice for immigrants in discussions with the Trump administration. “We will make your voice heard and work hard to see that a just and merciful solution for our broken immigration system is found that honors the dignity of the human person and keeps families together,” the archbishop told an appreciative congregation. Brenda Boyzo Vera, a member of St Luke Parish in Woodburn, said the archbishop’s message was powerful at this moment. “I feel a sense of hope after what he said to us today,” Boyzo Vera told the Catholic Sentinel, Portland’s archdiocesan newspaper. “After the recent presidential election where our community felt the racism, we come together today and the cathedral opened the doors to us and gave us a sense that we belong there, too,” said Deacon Jose Gonzalez of St. Anne Parish in Gresham. Many Oregon parishes have been holding meetings to soothe immigrant members and strategize about ways to assist them. Portland’s mayor-elect, Ted Wheeler, said the city will not cooperate with any new federal immigration actions that may emerge from the Trump administration. “On the feast of Our Lady of Guadalupe, we ask for the grace to be ‘with God’s people’ in such a way as to credibly carry the faith into the culture of our time,” he said. “On this day we are also called to pray for the many refugees of our day, the migrants and immigrants who long for a place to call home. “May we provide the same compassion and tenderness to those in need that Our Lady of Guadalupe showed to (St.) Juan Diego and the many people of faith who confide in her,” he added. Across the country in the Archdiocese of Washington, Hispanic and Anglo Catholics participated in a Guadalupe procession Dec. 10. Groups walked from two churches and then joined together for a Mass at the Basilica of the National Shrine of the Immaculate Conception. In his homily, delivered in Spanish, Washington Auxiliary Bishop Mario E. Dorsonville acknowledged the concern that many people gathered for the procession were feeling, saying that it is a difficult moment in our nation’s history for the immigrant community. But he reminded the thousands gathered that Jesus is always with them and his mother is always close by. On Dec. 1, the U.S. Conference of Catholic Bishops called on dioceses across the country to focus on migrants and refugees in prayer services and Masses they planned to honor Our Lady of Guadalupe, the patroness of the Americas, whose feast day is Dec. 12. In the Diocese of Brooklyn, New York, a Mass on the feast day was celebrated at the Co-Cathedral of St. Joseph in Prospect Heights. Bishop DiMarzio was the main celebrant of the Mass, with Brooklyn Auxiliary Bishops James Massa and Octavio Cisneros as concelebrants. Afterward, the diocese held its “Light of Christ” pilgrimage. The bishops blessed and lit the torches of Massgoers from 36 participating parishes throughout Brooklyn and Queens. The pilgrims carried the torches back to their parish churches as a sign of hope and love. In Indiana, at the University of Notre Dame, Holy Cross Father John I. Jenkins, president, invited all members of the university community and the public at large “to pray for immigrants, refugees and their families in our nation and throughout the world.” A special Mass was celebrated at the university’s Basilica of the Sacred Heart. “Notre Dame throughout its history has served immigrants to our nation, and we are proud to continue to do so. Let us pray in a special way for the immigrants and their families who are part of the Notre Dame family,” he said in a Dec. 11 statement. Thousands of Catholics packed the Cathedral of Our Lady of the Angels in downtown Los Angeles the evening of Dec. 11 to honor Our Lady of Guadalupe. The festivities began with traditional dancers on the cathedral plaza and veneration of a relic of the “tilma,” or cloak, of St. Juan Diego, on which the miraculous image of Our Lady of Guadalupe appeared in 1531. The celebrations culminated with midnight Mass celebrated by Los Angeles Archbishop Jose H. Gomez. Rios is editor of El Centinela, the monthly Spanish-language newspaper of the Portland Archdiocese.